1. In a cup, combine the garlic and olive oil. In a large pot of boiling, salted water, cook the pasta until al dente, about 11 minutes. Drain, reserving 1/2 cup pasta cooking water. 2. Meanwhile, in a large bowl, crush the tomatoes with your hands; season with salt and pepper. 3. Remove the garlic from the olive oil and discard. Add the garlic oil, butter and lemon peel to the tomatoes. 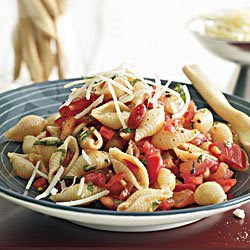 Add the pasta and toss, adding a splash of the reserved pasta cooking water to thin the sauce, if necessary. Add the basil and season with salt and pepper; toss. Serve with the parmesan.